Rain has brought some relief to fire crews fighting wildfires around B.C., especially in the southeast and Kamloops districts. An evacuation alert for 70 properties in West Kelowna, B.C. has been lifted because of cooler, wet weather. On Friday, an evacuation order for the city on Okanagan Lake was downgraded to an evacuation alert. On Sunday afternoon that alert was lifted. B.C. Wildfire Service says the blaze near Okanagan Lake is now 75 per cent contained thanks to firefighting efforts and favourable weather. Crews continue to monitor and work on the fire; residents are encouraged to be prepared in case conditions change. Rain has brought relief to crews fighting wildfires around B.C., especially in the southeast and Kamloops districts. 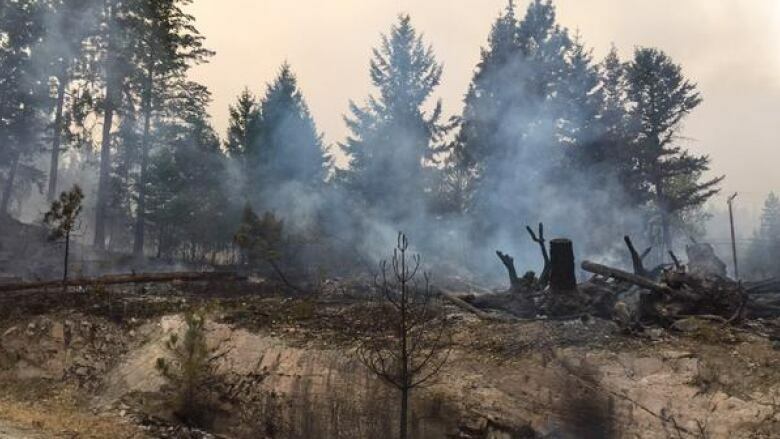 ​"There's finally some precipitation in the forecast for the south, certainly an area that could use it right now," said Fire Information Officer Ryan Turcot with the B.C. Wildfire Service. The rain isn't enough to soak the parched ground, but it is a help, said Turcot. Thanks to the cooler, wetter weather, only 13 new fires were sparked on Friday, compared to around 100 new starts last Monday. "That's still 13 more than we'd like to see, but definitely a lot better than what we were seeing earlier this week," said Turcot. Turcot said unsettled forecasts for the southern areas of the province are expected to continue throughout the day and possibly into Monday, although the associated winds and lightning could start more fires. There are approximately 200 active fires burning in B.C. ; 148 of those were caused by lightning.